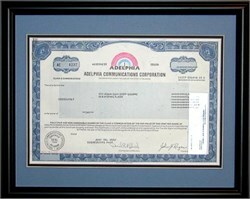 You may select and purchase any modern stock certificate for custom framing in this decorative wood frame. The image shown illustrates the framing and matting, but the certificate shown above is not included in the price. The actual size of a modern certificate is 8" x 12" which fits into a mat with the dimensions of 11" x 14". The certificate you select will be double matted using a blue, green, or red mat combined with a black liner mat, as shown in the illustration. This contemporary, black frame is 1" wide with an overall size of 12 3/4" x 15 3/4". Archival mounting, acid free backing, and clear glass are used in preparing your custom framed certificate.